Back-to-basics vanities, a floaring mirror and a meticulous flooring design transform a dated Wildwood bathroom into a fresh master retreat. 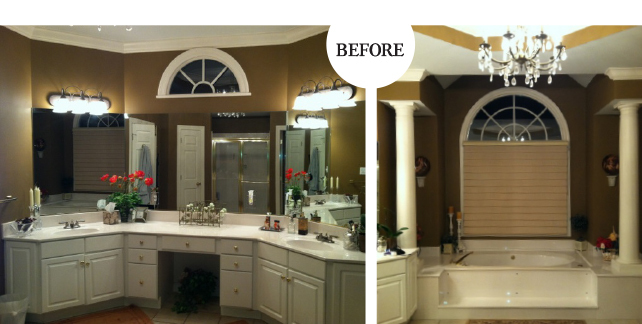 Tired of their dated master bath, a Wildwood couple was ready to transform their space into an elegant retreat. Crisp, fresh and clean were all buzz words at the forefront of the new design. Keeping the overall footprint of the existing space, the homeowners worked with bath designer Paula Anane, Signature Kitchen and Bath, and their trusted contractor Kurt Weiss, Weiss Construction, to create the master bath of their dreams. A beautiful, white Victoria + Albert freestanding soaking tub centered in an alcove under a large arched window is the dramatic focal point of the bath. Flanking the tub on the left and right are tall, decorative linen cabinets for storage. To get away from the dated look of their former built-in Jacuzzi tub, the freestanding tub is lighter and opens up the space. “One of the goals of this project was to utilize the large space in a more effective way,” Anane says. Another area of the old bath that felt closed in was the shower. Previously a small 5’x3’ fiberglass shower unit, the new design called for a large walk-in shower with a clear-glass panel that divides the shower from the room. Contractor Kurt Weiss designed a seamless infinity drain tucked under the plumbing wall in the shower, creating a zero-degree entrance which allowed the beautiful marble tile floor design to continue throughout the whole space. Now not only light and bright, the shower design also can accommodate the homeowners in the later years of their lives. In addition to the challenge of the floating mirror and vanities, the intricate flooring design was a major undertaking for all. 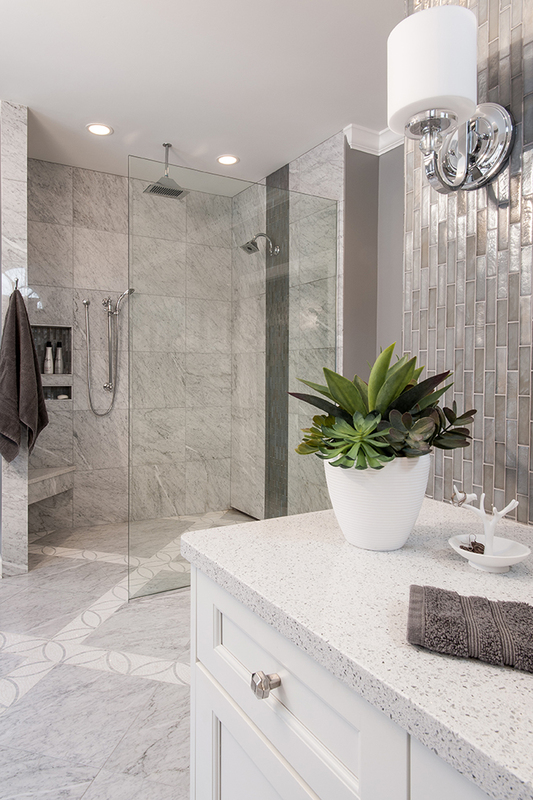 The homeowner saw the AKDO mosaic accent tile on Houzz, and it became the inspiration for the style of the entire bath. Instead of blanketing the entire floor in the tile, which would be a budget buster, the tile was used as an accent piece paired with a natural polished marble stone. Inset into the polished stone, the leaf pattern required meticulous thought and planning on the part of Anane and Weiss. “The accent tile is actually a 12”x12” tile, and we needed to cut it down to 6-inch strips,” Anane explains. Each tile had to be calculated, hand cut and configured to ensure the pattern would continue to flow as it had intended. “Weiss’ attention to detail and meticulous calculations resulted in an outstanding finished space,” she says. 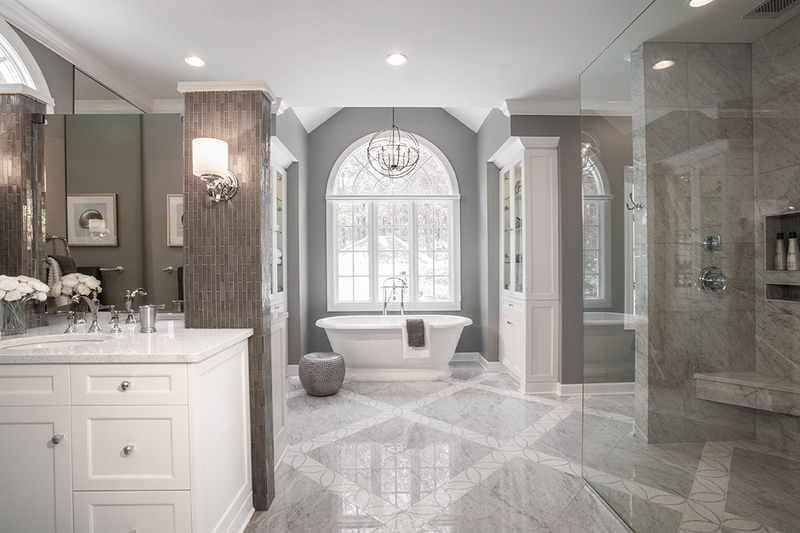 To complete the crisp, clean look, the walls were painted a neutral gray, which perfectly marries the accent tile in the flooring, the Carrera marble and the tile columns on the vanity and shower wall. The Cambria quartz countertops are snow white with reflective gem-like crystals, and paired with the chrome faucets, light fixtures and cabinetry hardware bring a touch of bling to the beautiful space.